See things differently? This article reflect ShareGate Desktop Desktop version 7.0 or greater. Manually update to the latest version or download the legacy Migration manual on our version page. This article will explain all aspects of the Google Drive connection screen. 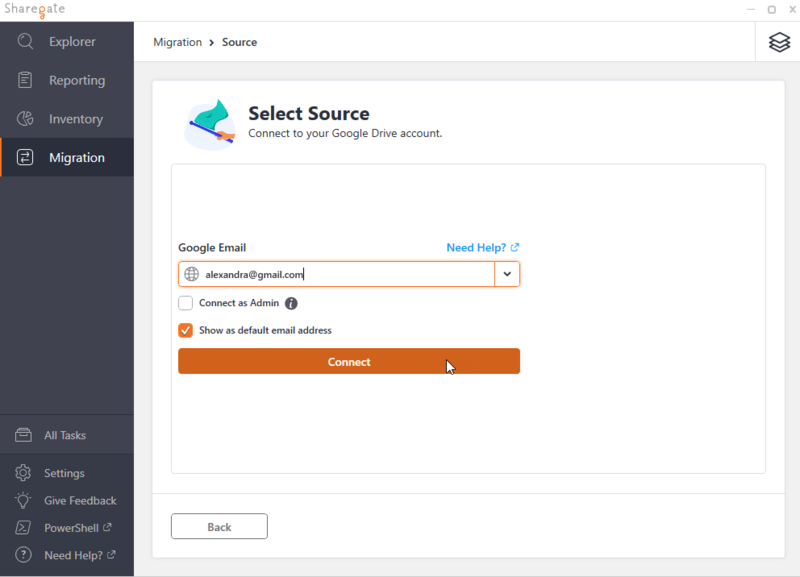 After selecting Import from Google Drive on the Migration menu, you will be prompted to sign in to your Google account. Browser authentication is the only available option. Enter your Google email address. If you want to migrate multiple users, selecting Connect as Admin is recommended (if you have the appropriate permissions). Show as default email address allows ShareGate Desktop to load this email address by default when opening the Import from Google Drive tool in the future. You will now see the Google Authentication screen. Enter your email address or phone number. Enter your password and click Next. You will now be connected to Google Drive on your Source. You can set up a 2-step authentication process on your Google account. If you do so, an additional step is needed. Otherwise, you will not see this window. Enter what Google requires for authentication. In this screenshot, Google asks for a code that is sent to a mobile device to prove your identity.